New Zealand-bred Trenton was a good, if lightly-used, racehorse, and a superior stallion whose progeny dominated late nineteenth century racing in Australia, and who got influential daughters that had a world-wide impact on bloodstock breeding. His sire, Musket, was at stud in England six years, long enough to get Petronel, winner of the 2000 Guineas and the Doncaster Cup, and Goodwood Stakes winner Brown Bess before his export to New Zealand by Thomas Russell, representing the Waikato Agricultural Company, intended as a sire of coach horses and hacks. He had been poorly patronized as a stallion in England; his sire, Toxophilite, had been a bleeder, and his dam's family had a reputation for producing horses affected in the wind. Showing little early promise, his owner, the Earl of Glasgow intended to have him shot at the age of two, despite his trainer's pleas; fate intervened when Lord Glasgow died himself, and Musket, along with the Earl's other horses passed to Lord Peel and George Payne, and there was no more talk of shooting the colt, who went on to win nine races, including the 2 -1/2 mile Ascot Stakes. In New Zealand Musket served mostly half-bred mares in the Cambridge district. When his English-bred offspring, particularly Two Thousand Guineas winner Petronel (a yearling when Musket was exported), started winning, he was bought by the Auckland Stud Company as a stallion for their Glen Orchard Stud in Auckland. The principals in the Auckland Stud Company were the brothers Thomas and Samuel Morrin and Major Walmsley; other shareholders were James Buckland, J.S. Macfarlane, Richard Taylor, Pierce Lanigan, William Percival and Joseph Bennet, all members of the Auckland Racing Club. Musket's first thoroughbred foal, born in 1880, was Martini-Henry, purchased by Australian Jockey Club Chairman James White, and winner, in Australia, of the 1883 VRC Derby Stakes in his first outing, and the next day of the Melbourne Cup. In 1882 the Glen Orchard Stud was sold, and the partnership, now operating under the name of the New Zealand Stud & Pedigree Company, established a new stud, Sylvia Park, where Musket became the premier stallion. Musket died in October of 1885, but in his few short years in New Zealand the partners had made good use of him; he sired between 120 and 130 colts and fillies, about eighty of them from registered thoroughbred mares. He got 26 winners of 87 classic races. He left some good daughters, and sons that were outstanding racehorses and sires, including Martini-Henry, Carbine, Nordenfeldt, Maxim (later sent to California), and Trenton. Trenton was bred at Wellington Park Stud, which was owned by the Morrin brothers, separate from the partnership that owned and operated Sylvia Park (which dissolved in 1891). Trenton's dam was the mare Frailty (1877 by the successful Australian stallion Goldsborough), a grand-daughter of a good racemare, Io (1856, by the great native-bred stallion Sir Hercules). Io had been born in New Zealand and taken by Henry Redwood to Australia to race, and sold there as a broodmare, where she produced some good fillies, including Flora Mcivor (1866, by New Warrior), the dam of Frailty. Io was a daughter of the Australian-born mare Flora McIvor (c. 1828), one of the first mares imported into New Zealand that traced to the General Stud Book, brought in by "Father of the New Zealand Turf" Henry Redwood. Flora McIvor was an outstanding broodmare that established an Australasian tail-female branch of Family 18 still active today; the grand AJC Derby and Cox Plate winner Strawberry Road (1979), that also won in France and Germany and was later a sire, descended in tail-female from Io. Thomas Morrin brought Io's line back to New Zealand when he bought Frailty in Australia and shipped her to Wellington Park, where she became one of the country's best-ever matrons. Frailty bred two winning daughters, Cissy (1886, by Musket), winner of the Auckland Racing Club's Welcome Stakes and Auckland Guineas, and Mary (1887, by Musket's son Nordenfeldt), also a winner of the Welcome Stakes. Cissy bred on, with winners in Australia. A third Frailty daughter, Edith Cureton (1893, by Castor), also bred on; she was second dam of New Zealand Derby and St. Leger winner Duo (1917), and ancestresss of 1976 Melbourne Cup winner Van Der Hum (1971, bred in New Zealand). In addition to Trenton, Frailty's winning sons were Niagara (1884, by Anteros), winner of the Auckland Great Northern Foal Stakes and a good three year old in Australia; Great Northern Derby winner Cuirassier (1885, by Musket), later a successful sire in New Zealand; Zalinski (1888, by Nordenfeldt) , winner of the VRC Loch Plate and VATC Toorkak Handicap in Australia; Havoc (1890, by Nordenfeldt), that went to Australia to win the AJC Cumberland Stakes, the AJC Plate and the VRC Australian Cup; Lancaster (1896, by Hotchkiss), winner of the Melbourne Stakes in Victoria (Australia); and Siege Gun (1898, by Musket's son Hotchkiss), a great galloper in New Zealand that took the Auckland Cup and the CJC Metropolitan Handicap in 1902. These were all high-class runners, especially the colts, most of which were able to go a distance. Trenton, a rich dark brown colt, grew to be a mid-sized, "perfectly balanced" horse. Turf writers Thomas Merry and O.N. Gillespie both commented on his beauty, particularly his "sculpted" head and neck. He had great presence and a good temperament, and wonderful action. When he arrived in England in 1896, one observer noted "He is by no means a typical 'Waler,' possessing far more length and quality than most of his class; indeed, he would be generally put down as an English thoroughbred sire." High praise. He did have a drawback, which affected his running -- shelly feet, which kept him lightly raced. He was a bit long in the back, and as he aged it began to drop. Trenton passed through several hands during his career on the turf, and later, in the stud. He won eight races in thirteen starts, with three seconds and one third; the only time he was unplaced was when he was injured during the running of a race and limped back to the scales. His feet were a problem, and kept him from racing as frequently as his many of his long-running, tough offspring would. In New Zealand he ran for the prominent New Zealand owner George Stead, who raced under the nom-de-course "G. Fraser." He won all three of his races as a juvenile: the 1883 Auckland Welcome Stakes (5 furlongs), the Midsummer Stakes, and the 1884 Canterbury Jockey Club Champage Stakes (6 furlongs), after which he was bought for 800 guineas by Australian-born Dan O'Brien, owner, at the time of the Racecourse Hotel at Riccarton, behind which he built a block of stables from which he trained and raced a series of winners; he is best known as the owner of Carbine when he raced in New Zealand at ages two and three. Trenton's feet limited his starts to two races at age three. He ran second to Vanguard in the Dunedin Cup, and, carrying 8 st.-9 lbs., won the CJC Challenge Stakes, beating a strong field. O'Brien set his sights on the Melbourne Cup, and before taking Trenton to Australia, organized a betting syndicate amongst his New Zealand cronies that would have had a £50,000 pay-off, had his plans worked out. In Australia Trenton duly won the historic Cup trial, the ten-furlong Melbourne Stakes (now LKS Mackinnon Stakes), beating a good older stayer, Sheet Anchor, who ran second. In the 1885 Melbourne Cup, all the action took place in the final furlong. Sheet Anchor (carrying 7 st.-11 lbs.) was leading, with both Trenton (7 st. - 13 lbs.) and the Musket son Nordenfeldt (who had won the VRC Derby easily) closing fast, followed by the mare Grace Darling (7 st-12 lbs., Caulfield Cup winner two weeks earlier). Trenton was boxed in and his jockey, Alick Robertson, lost his whip; Sheet Anchor won by a head, with Grace Darling half a head in front of Trenton, and Nordenfeldt fourth. Trenton went on to win the 2 mile VRC Royal Park Stakes (weight-for-age), and the then 3 mile VRC Canterbury Plate, beating Nordenfeldt by half a neck in the Australasian record time of 4:49-1/4. Trenton wasn't seen on the turf again until the AJC Spring Stakes, where he came in lame and unplaced in the ownership of Australian William Cooper. Next up was the 1886 Melbourne Cup. In this race he was carrying 9 st-5 lbs., and even merciless whipping by his jockey, Robertson, could not drive him to pass the lightly-weighted Arsenal, carrying 2 stone less. He lost by a neck. He went on to win the Royal Park Stakes in a canter, for the second time. His last race was the Canterbury Plate, but carrying 9 st.-6 lbs., he was beaten by a length by the good horse Trident (winner of the AJC and VRC Derbies and St. Legers), carrying 7 st.-3 lbs. Trenton was twice leading sire in Australia, and three times second and four times third on the list. His progeny included over 50 stakes winners that took practically every major race as sprinters, mid-distance runners and stayers, and quite a few were winning big races at ages eight and nine. He got two Melbourne Cup winners, and five of his daughters bred winners of that race. In 1895 he was purchased to England, and while not successful as a sire of winners there, despite receiving some very good mares, he got the second dam of Great Britain's leading sire Gainsborough, and the second dam of the five-time leading sire in the U.S., Bull Lea and his half-brother Espino. Through a son bred in England, he was the grandsire of the great U.S. champion gelding Roamer. Trenton was purchased by Andrew Town, whose father, William, had owned some great racehorses, including Tarragon (1858, by New Warrior, out of Ludia, Family C - 29), a champion racehorse and later a good sire, along with the imported Lord of the Hills (1854, by Touchstone), at Town's stud in Richmond, Cumberland County, New South Wales. Andrew stabled some horses near his townhouse at Richmond, and had a stud farm nearby at Clarendon; he served as a local magistrate and was a long-time Australian Jockey Club racecourse judge. He inherited Tarragon when his father died, and purchased the Victorian stallion Maribyrnong (1863, by Fisherman), who continued to get good runners at Richmond, notably the colt Australian Cup and AJC Derby winner Richmond, later sire of Aura, who would become the dam of Trenton's good runners AURARIA (1892) and AURUM (1894). In 1877 Andrew Town purchased Hobartville, an impressive property at Richmond, and all his stock were moved to his stud there. The great unbeaten racehorse Grand Flaneur was one of the stallions at Hobartville, where he got Williamstown Cup winner Merman; Merman was later brokered by the English Cobham Stud Company, where Trenton would eventually end up as a stallion, and went to England to win the great distance races in England for Lillie Langtry. Other stallions at Hobartville included Moorthorpe (imported in 1882, by Doncaster), and the American-bred trotting stallion Childe Harold (1871, by Harold). When Trenton joined the Hobartville Stud, Town had over 130 "blood" mares and 40 draught mares lodged there. In deciding how to breed Trenton, Town secured the advice of Australian bloodstock agent Bruce Lowe, author of Breeding Racehorses by the Figure System, who popularized the idea of numbering and categorizing female families. Trenton, Lowe told Town, "has a great liking for the Yattendon-Sir Hercules blood," basing his advice on the occurence of Sir Hercules and Rous' Emigrant in Frailty's pedigree, stallions Yattendon also carried, a notion breeders today know as returning to the best strains of the stallion's dam. Trenton winners bred on this principle included BLISS and her brother TRENCHANT, GALLARDIA, and GERARD, out of some of the twenty mares Lowe advised Town to purchase. Non-Town owned mares with Yattendon and/or Sir Hercules in their pedigrees included the dams of LADY TRENTON and ETRA WEENIE, both good runners and later exceptional broodmares. Before Trenton's first Hobartville crop even hit the track, Town suffered financial reverses, and Trenton was sold for 3,000 guineas to William R. Wilson, a prominent owner and breeder of the 1890s who owned St. Albans Stud at Geelong, in Victoria. Wilson's good horses included Strathmore (Family C - 3), winner of the Caulfield Guineas, Victoria Derby and St. Leger in 1891-2, and Carbine's outstanding son, Wallace. Trenton's stud fee at St. Albans in 1890 was 50 guineas; in comparison, Malua, who had won the Newmarket Handicap and the Adelaide, Australian and Melbourne Cups stood at 30 guineas. BLISS (1889) and her brother TRENCHANT (1890) were bred at Hobartville from the Yattendon mare, Bridesmaid. Bliss won the Queensland Hopeful Stakes (5 furlongs) as a juvenile, and two years later won the AJC Villiers Stakes. Trenchant won the 1893 AJC Derby. ETRA WEENIE (1889), from Nellie (Family C - 1), by Tim Whiffler, whose second dam was by Sir Hercules, won the VRC Maribyrnong Plate and the VRC Oaks for Herbert Power under a lease arrangment, and then returned to the famous Bylong Stud of George and John Lee at Bathurst, New South Wales, where she was bred. Her dam, Nellie, had been a really good runner, winner of the AJC Derby and other races. Etra Weenie is ranked among Australia's best broodmares, second, perhaps, only to Frailty. She bred a succession of great runners, including Sydney Cup winner Diffidence, later dam of three good runners; Melbourne Cup winner Merriwee and his sister Wigelmar, winner of the Debutant Stakes, and Posadas, a winner of the AJC Champagne Stakes. Her daughters were also terrific producers (see Family C-1), and this branch of the family is still producing stakes winners today. 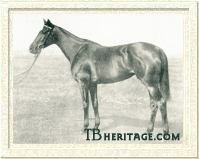 Another superior Trenton daughter was bred in 1889 -- LADY TRENTON (Family C - 7). She was by Yattendon, and out of Black Swan, and her big win was the 1894 Sydney Cup. In the stud she bred four superior racehorses: the great stayer Dividend (ten important wins, including the VRC Champion Stakes and the VRC Essendon Stakes twice each); VRC Oaks winner Lady Rylstone; Melbourne Cup and Sydney Cup winner Lord Cardigan, also winner of four other big distance races; and Strata Florida, winner of the Caulfield Guineas and the VRC October Stakes. Her tail-female line bred on into the 1940s, and included the great stayer Peter and the Melbourne Cup winning mare Rainbird (1941). DELAWARE (1890), from the Maribyrnong mare Genesta, won the AJC Craven Plate (10 furlongs) twice, the AJC Doncaster Handicap, and the AJC Autumn Stakes (12 furlongs) over several seasons on the turf. Trenton's daughter GLORIA (1890), from Aureola, by Angler, won the STC Challenge Stakes (6 furlongs), and produced two daughters that bred on; Jellaby (1973), winner of the Queen Anne Stakes and the Prix Perth and other races, was a descendant. Another foal from Trenton's 1890 crop was LIGHT ARTILLERY (1890), a good colt that won in Victoria, including the AJC Autumn Stakes and the AJC Plate, and later became a good sire son, getting some good classic winners in Western and South Australia, and Adelaide Cup winner Spinaway (1902). In the 1891 crop Trenton's winners included HAUGHTINESS (1891), out of the Lecturer daughter Lady Disdain: she won Adelaide's St. Leger Stakes. ROSELLA (1891), from a Yattendon daughter, Pardon, was a long-running winner of races, including the 1898 Hobart Cup, age seven. DREAMLAND (1891), bred at St. Albans, won the Maribyrnong Plate as a juvenile, and in 1901, age ten, won the Australian Cup (18 furlongs). He was out of Nightmare, a winner of seven races, by Panic, and his half-sister, Insomnia (1889, by Robinson Crusoe), a winner of the VRC Criterion Stakes, produced Trenton's superior daughter WAKEFUL (1896, see below). Another 1891 foal, QUIVER, from Tremulous by Maribyrnong, was a very good race mare for James Wilson, Jr. Like many Trentons, she got better as she got older. At age two she won a nursery handicap, and at three won the VRC Handicap and was second in the two mile Sydney Cup, carrying 8 st.-1 lb. When she was four she took the AJC Spring Stakes (12 furlongs) and Randwick Plate (24 furlongs) , Sydney Tattersall's Club Cup (16 furlongs, carrying 9 st.-2 lbs. ), the VRC Essendon Stakes (12 furlongs), and dead-heated with Wallace in the VRC Champion Stakes (3 miles), in 5:23-1/4, and placed third, carrying 8 st.-9 lbs. in the Caulfield Cup. After running second in the VRC Loch Plate she was sold to India, where she won the Viceroy's Cup. And her brother, Aurum Wilson obtained the mare Aura (1886), by Richmond (1872, by Maribyrnong). Richmond had been bred at Andrew Town's Hobartville Stud, and sold as a yearling. He was a small, outstanding stayer and later a good sire. He won the AJC Derby, the AJC Randwick Plate (then 3 miles), the VRC Canterbury Plate (2-1/4 miles), the Australian Cup, the VRC Town Plate (2 miles), and many other races in seven seasons on the turf. For Wilson Aura produced AURARIA (1892) and her brother, AURUM (1894, see below). Another important foal of Aura's was Aurous (by Wallace), who was the second dam of a great Australasian race mare, New Zealand-bred Desert Gold (1912). AURARIA was sold to South Australian David James and placed in training with John Hill. James was a contractor, who, in 1883, with partner Jim Poole and Charles Rasp "pegged" a mineral claim on a sheep station in New South Wales; this became the Broken Hill claim, the world's richest deposit of lead, silver and zinc. James settled at Kapunda, South Australia, where he was a successful local politician, and later a member of the legislative assembly. In 1894 purchased a nearby estate he named Coalbrook Vale, where he established a racing stud. The tough filly AURARIA won ten races, most came at the age of three, three of them (plus a third placing) over four days, including the Melbourne Cup. In South Australia she won the SAJC Elder Stakes (9 furlongs), the South Australian Derby, the SAJC West End Draught Stakes, and the Adelaide Racing Club's Parkside Stakes (9 furlongs). In Victoria she took the VRC Nursey Handicap, Flemington Stakes, C.B. Fisher Plate (dead-heat with Wallace), the VRC Oaks, and, as a 50 to 1 shot, she won the Melbourne Cup, carrying 7 st.-4 lbs. She bred on, producing winners in South Australia through the mid-twentieth century, and a descendant of hers, Primavera (1938) won the VRC Oaks. Her brother, AURUM (1894), was a good juvenile for Wilson, and later a versatile runner able to go a distance. He won the VRC Sires' Produce Stakes and Ascot Vale Stakes, and the AJC Champagne Stakes. At age three he won the Caulfield Guineas, the VRC Flying Stakes (7 furlongs) and Spring Stakes, the AJC Easter Stakes, VRC C.B. Fisher Plate (16 furlongs), and the VRC St. Leger Stakes (14 furlongs). He ran second in the VRC Derby, and placed third in both the Melbourne Cup and the Australian Cup. Like Trenton, he was shipped off to England for stud duty, but "not at all sure with his mares," got few foals there; one, Aurina, won the Prince Edward Handicap at Manchester in 1906. He was shipped back to Australia, and in 1918 the aged fellow was sold in Melbourne for the grand sum of 10 guineas. Others in Trenton's 1892 crop included O'TRIGGER, from the imported Barcaldine daughter Barley; he won the 1897 VRC Bagot Handicap (13 furlongs). THE MERRY BOY (1892), a gelding out of Mara, by The Ace, won the South Australian St. Leger over 14-1/2 furlongs. TREASON (1892, from Sedition by Neckersgat, Family C - 21), ran as a sprinter twenty-seven times, winning the Moonee Valley Purse, the Epsom Purse, and two trial handicaps. She bred Elvo (1900, by Malvolio), a really good winner of the VRC Hotham Handicap and Autumn Handicap, the AJC Plate and Sydney Handicap, and placed in many important distance races. Elvo was the mare through which this colonial family continued. ONSLOW (1893, out of Sumatra by The Pontiff, won the WATC Railway Stakes, and in 1899 the Kalgoorlie Cup. RESOLUTE (1893), a son of the Newminster (Australian) daughter Umilta, was a speedy winner of the VRC September Stakes, and in 1898 the 5-1/2 furlong Oakleigh Plate, and the inaugural running of the 7 furlong VATC Futurity Stakes; he was later exported to England. Trenton's 1894 crop included the gelded RELIANCE (1894, from imported Elsie by St. Simon), winner of the WATC All-Aged Stakes, and THE PRIZE (1894, from Lady Granville), winner of the NJC Newcastle Cup. Trenton's son MAJESTIC (1894) became a reliable sire, and reached fifth on the leading sires list in Australia in 1906-7. ELUSIVE (1894) was a daughter of the imported mare Eleusis, by Barcaldine. She won the VRC Oaks, and her sister, DELUSIVE, born the next year, won the 1899 Williamstown Cup (11 furlongs). Both sisters were broodmares in George Clifford's Stonyhurst Stud in New Zealand, and had stakes-winning descendants; AJC Derby winner Battle Sign (1972) was a distant descendant of Elusive. SYMMETRY (1895) was another of Trenton's VRC Oaks winners. She was out of Buttercup, by Panic. 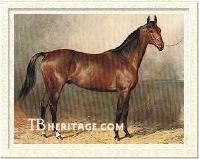 TREMARDEN (1896) from Lady Marden, by Marden, a member of Trenton's last crop in Australia, won the VATC Debutant Stakes and the VATC Caulfield Guineas. Trenton had two more excellent offspring born after he left for England: Melbourne Cup winner REVENUE (1896), and the great "First Lady of the Australian Turf," WAKEFUL (1896). Wakeful Standing 15.2 hands when grown, and heavily muscled, WAKEFUL (1896) was a legendary champion mare, "First Lady of the Australian Turf." She was bred by Wilson at St. Albans Stud, the only foal of her dam, Insomnia (1889 by Robinson Crusoe), winner of the VRC Criterion Stakes and one other race in 32 starts. Wakeful was a friendly filly with her sire's temperament. Fast, and a weight-carrier despite her small size, she was a versatile winner of Australia's biggest races, including sprints, weight-for-age races, and distance handicaps, and her gameness made her a popular idol of the turf. Her final career tally was 25 wins and 12 seconds in 44 starts, and she was unplaced only three times. She was also a successful broodmare, producing, among others, Melbourne Cup winner Night Watch. She is honored today with the Flemington's Wakeful Stakes, the premier prep race for the Victoria Oaks. When the St. Albans stud was dispersed in 1900, the unraced WAKEFUL and the gelding REVENUE were purchased by the St. Albans stud manager, Leslie Macdonald. Wakeful was placed in training with Hugh Munro at Mordialloc Stables. Her wins over four seasons included such sprint races as the VATC Oakleigh Plate (5 furlongs, by four lengths) and the VATC St. George Stakes (7 furlongs); the important mid-distance races such as the VATC Eclipse Stakes, twice (11 furlongs), the VRC Melbourne Stakes (10 furlongs) three times, and the VATC Caulfield Stakes (9 furlongs), twice; and such big races as the VRC C.B. Fisher Plate (12 furlongs), the AJC Randwick Plate (1-1/2 miles), and the Sydney Cup (2 miles). In almost all she beat large fields of the top horses, and in the handicaps, she ran under the heaviest imposts. Her crowning glory, however was her heart-breaking second place in the 1903 Melbourne Cup, carrying 10 stone, the highest weight ever carried by a mare in that race (to date), when she lost in the last few strides by 3/4 of a length to Lord Cardigan, to whom she was giving 45 pounds. A record crowd of 95,000 came out to see this, her last race, and her game effort cemented her already secure place as the best mare ever to run in Australia. Macdonald kept Wakeful until she died in 1923; she bred a number of foals for him, but none of her daughters were of any use on the turf or could continue her tail-female line. She produced several good sons, however. Blairgour (1907, by Wallace), got some of her speed, winning the Oakleigh Plate-Caulfield Futurity Stakes double in 1911, and the VATC Memsie Stakes. Baverstock (1911, by Maltster) only won two races, but was a useful sire of some high class winners, including the long-running David (1917), a horse that won most of the important distance races in Australia in his 124 starts to age eight, including the Sydney Cup, the Cumberland Stakes (twice), and the AJC Randwick Plate four times. David was later a superior sire of steepelchasers and hurdlers, getting many winners of Australia's Grand National Steeplechase and Grand National Hurdle, as well as some good flat distance runners. Wakeful's son Night Watch (1913, by St. Alwyne) won the 1918 Melbourne Cup in record time, although lightly-weighted, and went on to carry heavy weights and win the VRC October Stakes, the Caulfield Stakes, and the Peace Cup Handicap, and ran second to the more lightly-weighted Lucknow in the Caulfield Cup, beaten by a neck. Revenue REVENUE (1896), was bred at St. Albans from Water Lily, by Rapid Bay. He had won the VRC Sires' Produce Stakes for Wilson in 1899, and was purchased, along with WAKEFUL, by Leslie Macdonald at the St. Albans dispersal in 1900, after Wilson's death. Like WAKEFUL, he was put in training with Hugh Monroe at Mordialloc Stables. In the 1901 Melbourne Cup, her owner and trainer, judging that WAKEFUL, with her heavy impost, was less likely to win, transferred WAKEFUL'S regular jockey, F.J. Dunn, to Revenue, who was only carrying 7 st.-10 lbs. He did win the race, beating a field of 18 other horses, including the good stayer San Fran (9 st.-1 lbs.). His only other major win was the VATC St. Helier Stakes (9 furlongs) in 1902. In addition to the mares noted above, Trenton got dozens good producing daughters that bred on in Australia, and became tail-female ancestresses of good stakes winners there, and in New Zealand, Malaysia, and Japan. One good one was George Clifford's MADOWLA (1893), a broodmare at Stonyhurst in New Zealand, produced New Zealand Derby winner Masterpiece (1908), and daughters with classic-winning descendants in Australia and New Zealand. In 1895 Wilson found himself heavily in debt, and St. Albans Stud was disposed of by lottery sale (Wilson repurchased the property from the winning ticket holder for £24,000; 125,000 £1 lottery tickets had been sold), including some livestock, notably his stallions. Trenton and the New Zealand-bred Carnage were purchased by the English bloodstock agent William Allison, principal of the International Horse Agency and Exchange, which secured and sold bloodstock world-wide, and manager of the resurrected Cobham Stud Company. Trenton's sales price was reported as £3,500. Allison was a lively and colorful character, a sometime lawyer, and most known as a sporting journalist associated with The Sportsman. He was a life-long bloodstock deal-maker, with close contacts in France, America (he sold a number of mares to James Keene), and Australia; he was also a big supporter of Bruce Lowe's "figure system" theory, having edited and published the first and second editions of Lowe's book and was credited (or blamed) for spreading its popularity in Great Britain via his own book, The British Thoroughbred Horse (1901) and through his columns in The Sportsman. Carnage (1890, by Nordenfeldt, and out of Carbine's dam, The Mersey), had been purchased by Wilson and for him won the VRC Champagne Stakes, Spring Stakes, Derby and Essendon Stakes, and as a three-year-old was just beaten at the wire, after leading the entire race in the 1903 Melbourne Cup. 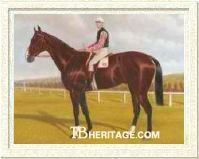 He was a stallion at St. Albans, and left two good stakes winners from his 1896 crop there -- C.B. Fisher Plate and Moonee Valley Cup winner Combat (also winner of races in South Australia), and Memsie Stakes winner Seclusion. The Cobham Stud Company, had been a commercial enterprise with multiple investors in the 1870s, where Blair Athol stood at stud for much of his life, and where other stallions included Derby winners George Frederick, Macaroni, and Blue Gown, as well as See Saw, Wild Oats, Marsyas, and others, and some good mares and foals were lodged and bred there. It crashed in debt in the late 1870s, and at a dispersal sale in 1880, quite a few good mares were picked up by George Stead, who shipped them to his New Zealand stud, where they became very influential, among them Nelly Moore (1872), who was carrying Lochiel when she arrived, and Steppe (1868), dam of Russlley, Stepniak, Stepfeldt, and She, the dam of Bobadil. Lochiel would become a five-time leading sire in Australia, and Stepniak headed the sire's list in New Zealand three times. William Kite, from Kelso, was also at the sale and purchased Maltese Cross, in foal to Wild Oats: that foal was the influential Australasian stallion Gozo. In 1895 Allison took over the lease of Cobham, and set about building up a new collection of stallions. In addition to Trenton and Carnage, the first horses installed there were Petronel, Musket's under-ultilized Guineas-winning son, Prince Rudoph, Sorcerer, Son of a Gun and Bushey Park. Later Allison brought Sceptre's half-brother, Collar (by St. Simon and out of Ornament), back from South Africa, and added Baliol, Sir Visto, Patron, the Australian-bred Merman, Bill of Portland (also secured from St. Albans), and St. Gatien, the latter exchanged for Carnage and some cash. In 1916 the 21 year lease on the Cobham Stud property expired, and was not renewed by the elderly Allison. Trenton and Carnage arrived in England in February of 1896. The voyage was rocky for Trenton, age fifteen and overweight, who became seriously ill, and pulled through due to the "unremitting care and attention of Ewart, who had charge" of both horses. He lost a lot of weight while ill, but even so, an observer seeing him several weeks later said that despite being a bit "tucked-up" he appeared "remarkably full of life and spirit." At age fifteen, Trenton's best breeding years were behind him. He got few winners; the world had moved on, and late-maturing stayers such as his offspring had little chance to show their stuff without a long-term committment from an owner. One daughter, PALMY DAYS (1900, from the Barcaldine daughter Pallanza), was a good stayer, winner of the Liverpool Autumn Cup and the two mile Northumberland Plate. Trenton's daughter COO-EE (1899, from Lady Sterling), bred at Cobham by Allison, produced some winners. Her son Call o' the Wild (1913, by Polymelus), won the Payne Stakes in his only three outings before breaking his leg. Coo-ee's daughter Bill and Coo (1909, by William the Third) ran third in the Ascot Gold Cup and the Oaks, and produced Last of the Dandies (1927), a winner of fifteen races and a successful sire of steeplechasers in Ireland (dam's sire of Grand National winner Hallo Dandy). Irish Oaks winner Conversation Piece, Irish Oaks and Ebor Handicap winner Cinq a Sept, and Ballyogan, sire of Two Thousand Guineas winner Ki Ming, were all descendants of COO-EE. THEODORA (1898, from Musidora by Bend Or) bred two daughters, Tofana (1912) and Tonga (1914), both of which were influential mares in Germany. Tonga (by German sire Fels) produced the in-bred Torero (1924, by Fervor), winner of the Union Rennen, Grosser Hansa-Preis and other good races. Tofana was an ancestress of the four good sons of Treiberwehr (1958): Tajo (Preis von Europa and other races), Tannenbruch (Preis des Wintervavoriten), Tannenberg (Deutches St. Leger, Grosser Preis von Nordrhein-Westfalen, etc. ), and Tannenhorst (Furstenberg Rennen). Trenton's most significant British daughter, as it turned out, was a tiny filly, ROSALINE (1901, from Rosalys by Bend Or); she was given away and then sold at public auction for 25 guineas. Bred to St. Frusquin, she produced Rosedrop (1907), winner of the Epsom Oaks Stakes, Great Yorkshire Stakes, the Atalanta Stakes at Sandown, and second in Liverpool's St. George Stakes and the Kingsclere Stakes at Newbury. Rosedrop produced English Triple Crown winner Gainsborough (1915), later twice leading sire in Great Britain, and Rosern (1927), the dam of Widener Handicap (USA) winner Sunglow (1947). Torpoint TORPOINT (1900, out of Doncaster Beauty by the late-maturing stayer Sheen) was the best of Trenton's offspring in Great Britain. Torpoint was bred by Col. Alwyn Greville and sent to the July sales as a yearling, where he was basically pinhooked, purchased by J.H. Hoole to supplement his small number of colts from his Wisdom Stud, slated to go to the Doncaster sales in the fall. He was seen by Washington Singer at that time, who offered Hoole the price of 150 guineas plus £25, but Hoole refused. At Doncaster Torpoint did not reach his reserve of 200 guineas, and Singer secured Torpoint for 150 guineas, plus another £50 when Torpoint won his first race, which occurred when he was age three. A flat-out stayer, Torpoint got going after warming up over the first mile and a half in a race, and it was several years before he matured into good form for his owner Washington Singer. Trained by Alec Taylor, who "had a strong affection for the horse," he won some minor races at ages three through five, and was second to Feather Bed in the Chester Cup at age six, his only start that season. But at age eight he won the two mile Ascot Stakes, the 2-3/4 mile Alexandra Plate, and was third in the Chester Cup, the Jockey Club Cup and the Lancashire Handicap. The next year, age nine, he won the Alexandra Plate again, beating Radium by four lengths, was second by a neck to Radium in the Goodwood Cup, and third to White Knight and Radium in the Ascot Gold Cup. He retired to the Manto Stud in 1909, having won £6,046 and six of his twenty-one starts, placing second five times, and third six times. Torpoint was a minor sire at Taylor's Manton Stud in Wiltshire, where Bayardo held sway. His daughters, however, did good service. Pinprick (1917, out of Third Trick by William the Third), won the Leicestershire Oaks by three lengths, and was second in the Yorkshire Oaks and Liverpool St Leger, and later produced the unbeaten Mannamead, later a leading sire in Hungary. Torpoint's cleverly-named daughter Hamoaze (1911, from Maid of the Mist, by Cyllene), won the Romsey Handicap at Folkstone and the Leicstershire Stakes, and was later a terrific broodmare of four high-class runners, all of which were at or near the top of the leading sires' lists in the countries to which they were exported. These were the sweet-tempered Buchan (July Stakes, Chesterfield Stakes, Eclipse Stakes, Champion Stakes, Chester Vase and Doncaster Cup and second in the Derby); Buchan's brother Saltash (Waterford Stakes, Eclipse Stakes, Gratwicke Produce Stakes, later an influential sire in Australia); Tamar (Gratwicke and Gordon Stakes, second in the Derby, later leading sire in Hungary); and St. Germans (Liverpool St. Leger, Doncaster Cup, Coronation Cup, also second in the Derby, and leading sire in the U.S. in 1931). Torpoint's daughter St. Eloi won the Alexandra Stakes, and Scarlet Martagon produced Irish Oaks winner Ixia and other winners. TORPOINT was in turn-out in his paddock in the summer of 1917 when he attempted to jump a gate, fell, and broke his back, a great blow to Manton Stud, which had only shortly before lost Bayardo. Trenton did get several dozen other English daughters that bred on, and a number have distant stakes winning descendants in various parts of the world. One British daughter, TRINKET (1902), bred by J.A. Doyle, sold at Doncaster as a yearling for 80 guineas, won a selling nursery at Thirsk, where she was bought for 100 guineas, and afterwards the best she could do was third in a selling handicap at age 3. She was sold to John O'Keefe who took her to Australia, where, to the cover of Bright Steel at the Reynolds Hobartville stud at Richmond, NSW, she produced the 1917 Melbourne Cup winner Westcourt (1912) for her new owner, H.R. Denison. A few English-bred daughters and one son were sold to the U.S., where they had an impact on bloodstock breeding. 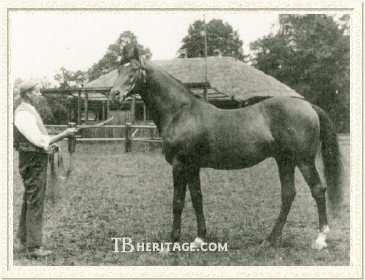 The English-bred Isonomy daughter Sandfly (1889) was sold to James Keene, owner of Castleton Stud in Lexington, carrying her Trenton filly, MIDGE (1902), in-utero. Midge later produced Keene's Belmont Stakes winner Luke McLuke, later a good sire. COLONIAL (1897) was born in Great Britain, and sent to James Ben Ali Haggin's California stud Rancho del Paso with her dam, Thankful Blossom (by Paradox) in 1901. 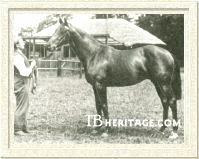 When Haggin moved his operations to his new stud farm, Elmendorf, in Kentucky, a few years later, COLONIAL was included in the mares he retained, and in Kentucky, to the cover of Ballot, she produced Rose Leaves (1916), dam of a number of winners, most notably the good runner Bull Lea (1935, by Bull Dog. Winner of the Kenner Stakes, Blue Grass Sakes, Pimlico Handicap, Widener Handicap, and other races) that was later leading sire in the U.S. five times, and top of the U.S. broodmare sires list four times. Rose Leaves also bred Bull Lea's sister Nectarine (1932, winner of 11 of 26 starts), and his half-brother, Espino (1923, by Negofol, winner of the Lawrence Realization and Saratoga Cup, and later a sire). 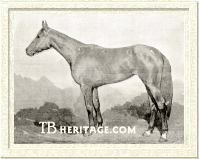 In 1900 the St. Simon mare St. Mildred, belonging to Montana copper king Marcus Daly, who owned both the elaborate Bitter Root Stud in Montana and Apperfield Stud in England, was shipped to New York as part of a dispersal sale following Daly's death. She was carrying Trenton's son KNIGHT ERRANT in utero, and was purchased by James Keene of Castleton Stud in Kentucky. KNIGHT ERRANT was a well-bred, well-performed horse on the turf, running at the highest class, and at age three was second to the great stayer Ort Wells in the 1904 1-1/2 mile Brighton Derby. But the Keene stable was unable to keep him sound, and he quickly faded from the racing scene. He ended up as a "teaser" stallion at Col. E.F. Clay's Runnymede Stud in Kentucky, where the Bona Vista daughter imp. Rose Tree (1896), daughter of the unplaced Fanny Ralph bred by C.D. Rose (owner of Bona Vista and Cyllene), was a broodmare. Rose Tree had been a modest winner on the British turf: she had won Ascot's Wokingham Stakes, beating a good field, and was second to Sundridge in the July Handicap at Newmarket, giving him 13 pounds, and earlier had won two handicaps at Newmarket and the Glasgow Nursery at Doncaster, but for the most part ran as a selling plater. In the U.S. she won some minor races before becoming a broodmare at Runnymede, where she had produced nothing of note. By 1910 she was completely blind, and rather than send her off-farm for breeding that season, or breed her to his already blind stallion, Starshoot, Clay bred her to KNIGHT ERRANT. The result of this breeding was the small (15.2 hands) gelded bay Roamer (1911), an outstanding racehorse for his purchaser, Andrew Miller, that won 39 of his 98 races and over $98,000 in winnings in his seven seasons on the turf. He was the leading money-earner in the U.S. in 1914, and set a North American record for a mile in an exhibition race at Saratoga in 1918, when he was seven years old. Roamer's excellence has usually been attributed to his dam, Rose Tree, by Two Thousand Guineas winner Bona Vista (sire of Cyllene), but she never bred anything else like his class, and her female line was fairly weak, being out of a non-winner, with the third dam, Elm, a winner of selling-level handicaps at Epsom and Newmarket and minor venues, her best probably the Drayton Handicap at Goodwood. It is at least as likely that Roamer's wonderful action and long-running ability to go all distances with speed was attributable to his underutilized, unsound sire, and his grandsire, Trenton. KNIGHT ERRANT got very few opportunities at stud, with no more than five foals in any year, and often less. Plus, his principal years of breeding anything were 1908 through 1911, and most of his offspring were juveniles and three-year-olds in 1910-13, when racing was dark in much of the U.S. Still, he got a top class steeplechaser, Hibler (1909, from Margaret Roche by the Sir Dixon son Orimar), that won the American Grand National Steeplechase, the Beverwyck Steeplechase, and the Saratoga Steeplechase, and placed second or third in several others, including the Brook Steeplechase at Belmont Park, and the Corinthian Steeplechase and Shillelah Steeplechase, at Belmont and Saratoga respectively. Another son, Blankenburg (1910, from a Hindoo daughter) won Aqueduct's Glendale Steeplechase and the Chevy Chase Steeplechase at Laurel. KNIGHT ERRANT also picked up a few daughters of Belmont and Withers Stakes winner and one-time U.S. leading sire Sir Dixon, who had been a stallion at Runnymede. When he got to breed to a quality mare, such as the Sir Dixon daughter Outcome (winner of the Latonia Oaks, Ramapo Handicap and Merchants' and Citizens' Handicap) he got Lady Errant (1911), and she won the important 2-1/4 mile Latonia Cup in 1914. Lady Errant produced Laura Dianti, winner of the New Rochelle and Knickerbocker Handicaps and five other races in 23 starts and was, through her daughter Laura Gal, second dam of the Champion U.S. Horse (twice) Challedon. KNIGHT ERRANT'S daughter Lassie (1909), from the Sir Dixon daughter Amaranth, was dam of Tijuana Cup winner All Over (1919) and the long-running colt Mons Meg (102 starts), and second dam of Kentucky Oaks winner Mary Jane. Trenton was often referred to as Australia's equivalent to his contemporary, the English stallion St. Simon. He was the dominant stallion of his era in that country, and it seems, as turf writer Thomas Merry said, "a great pity he ws ever sent over to England...in Australia he got race horses from mares that had never produced decent selling platers to any other stallion..." But then, the world would never have seen Gainsborough, or his son Hyperion, or Bull Lea and all his offspring, or the super gelding Roamer. ©1997 - 2006 Thoroughbred Heritage. All rights reserved.